I admit I first became interested in Clun Forest sheep from a picture on the British Wool Board sheep poster. The breed just looked good; it was alert, handsome, and medium sized. Eight years later my husband and I finally contacted the association’s secretary, and realized that this relatively unknown breed would fit into the way we wanted to raise sheep. We were looking for a breed that could take care of itself at lambing time, was productive, and could produce wool and meat on pasture. Many breeds promise this, but few deliver. After seven years of raising Cluns, I can say that to my delight, Cluns deliver on the promise. Many producers have turned to Cluns because they are tired of pulling lambs, tired of sluggish lambs that don’t seem to know where to look for their first drink, tired of having to buy one ram for market lambs and another to produce replacement ewes, tired of having to pour pound after pound of grain into their market lambs because they just don’t fatten on grass, tired of high-maintenance ewes, tired of ewes that don’t look after their lambs, and just plain tired. We raise both purebreds and crossbreds and are particularly impressed with the crossbreds. As one producer put it, “I’ve never seen a breed stamp itself so strongly on crossbreds as the Clun.” To best understand what Cluns can do in a crossbreeding program, let’s look at the strong points of the breed itself. In this case, to understand the purebred is to understand the crossbred sheep. Several years ago, I surveyed more than 50 Clun breeders and crossbreeders, and with few exceptions most rated Cluns “Superior” (the highest rating) to other breeds they had raised when comparing them for ease of lambing. According to the survey results, Cluns easily outperformed Suffolks, Columbia, Cotswolds, Targhees, Montadales, and Dorsets in the categories of ease of lambing, lamb vigor at birth, mothering ability, and milking ability. Many breeders stated that they worried less about the ewes at night or while at work because the ewes could take care of themselves. The lowest lambing percentage of purebred Clun breeders responding to the survey was 150%, but by far, most reported 180% to 200% lambing crops­and not a drop of Finn blood. Along with ease of lambing comes a very strong mothering instinct. What continues to impress me most about the Clun and Clun-cross ewes is that mother and offspring stick together like glue. We’ve raised other breeds that had occasional ewes that were what I’d call “super mothers,” but I’ve rarely seen such a high degree of attentiveness and mothering abilities so widespread as among all the Clun ewes. 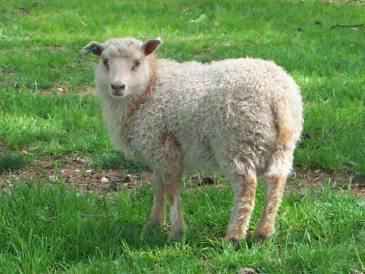 Other outstanding traits include hooves that need trimming only once a year (if that), a productive long life, medium-size ewes (140-160 pounds), alert and protective ewes, rams that are eager to breed, dense wool, and a strong flocking instinct. Since we shear our own sheep, we also liked the clean points. In a crossbreeding program Cluns are particularly rewarding. Not everyone wants to raise purebreds, but many producers would like one good sire breed to cross on commercial ewes to produce both replacement ewes and market lambs. Cluns come as close as any breed to serving both purposes. Survey results indicated that Clun-cross ewes outperformed Suffolks, Dorsets, Targhee, Montadales, Hampshires, Suffolk cross, and Columbia cross ewes in the categories of ease of lambing, lamb vigor at birth, and mothering ability. In the categories of milking ability, handling ease, wool quality, longevity, growth rate, and foraging ability, all but one breeder felt Clun crosses outperformed other crosses they had raised. 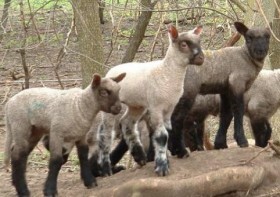 Clun-crossed market lambs tend to produce high-quality, lean carcasses. A Canadian breeder uses a Clun ram on Border Leicester ewes and reports a dressed weight of 50 to 65 pounds at 125 to 140 days. Another Canadian breeder relates that “we have our own system of marketing lambs. We see and deliver all carcasses and see many of them cut. A Clun Forest ram on Dorset ewes yields a preferred carcass having good dressing percentage, consistent fine-grain muscle, mild flavor, and well-proportioned with fine bone.” In a recent Canadian Sheep Federation Lamb Carcass Competition, a Clun-Suffolk carcass took third place with only a few points separating it from second place. When we have lambs slaughtered, we often like to look at the resulting carcasses in the locker. We once had a Suffolk-Finn-Targhee cross lamb and a Clun cross lamb slaughtered. There was a twenty-pound difference in live weight, but only a five-pound difference in hanging weight. Looking at the carcasses, one could easily see which one was the Clun cross­it was the one with the meaty leg. Over the past seven years we have crossed Cluns to Border Leicester crosses, Finn-Targhees, and unknown mixed breedings. We have also crossed Suffolk rams and Border Leicester rams onto Clun ewes. It doesn’t seem to matter whether you cross a purebred Clun ram on crossbred ewes or cross a Suffolk or Border Leicester ram on Clun ewes; both crosses inherit the strong, meaty build of the Cluns, their mothering ability, and their foraging ability. During the winter, we feed supplemental grain to the ewes depending on the severity of the winter. While other ewes are still lingering by the grain bunks nibbling up that last kernel of corn, the Cluns are waiting for you at the hay bunk. Most producers of Clun-cross lambs raise them on pasture with grain amounts varying from none up to one pound daily. 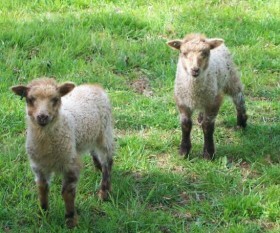 Our Clun crosses gain on average about 0.8 pounds a day (adjusted 120-day weights) on pasture plus one pound of grain. This system may take another month to produce a market-weight lamb, but we feel that we have pasture available and prefer a lower-cost, pasture-based system over a labor-and-management-intensive confinement system. As we continue to improve our pastures, we expect to see a higher rate of gain. We are particularly pleased with our crossbred Clun ewes. Nearly every one of them lamb by themselves from their first lambing forward; they have plenty of milk, are very attentive to their lambs, and recover from lambing in excellent condition the following summer on a diet of native lowland grasses. They are the first group of ewe lambs we have ever raised that kept their condition so well during their first 18 months of life while doing an exceptional job of rearing their lambs. I am convinced we have found a commercial ewe cross that fits with the way we want to raise sheep. Clun Forest sheep are an interesting, unique breed with very strong mothering, breeding, flocking, and survival instincts that have not been watered down by “improvements” from other breeds. Whether raising market lambs or replacement ewes, consider Cluns.